We’ve had a visitor! Since we live in the sticks, that is not a frequent occurrence. The whole house has been in an uproar. This past Monday night at the last potty before bedtime, I let the kids out as I usually do. Only after they hit the back lawn did I look up and notice a pair of shining green eyes amongst the shamefully un-whacked weeds. Oh Crap!!!! What the heck is that? Cat? Skunk (oh god please no)? Porcupine (oh god please no again)? It was too late; the hounds had already been released. I held my breath, waiting for the imminent fracas. Except my alleged sight hounds didn’t seem to notice the mystery interloper. Feeling like I had a chance, I nonchalantly sauntered down the steps and inched my way towards Bettina. I knew that if anyone was going to get into trouble in this situation, it would most certainly be my Vice President of Checking Stuff Out. So when I reached her, I got hold of her then turned to deal with the beastie in the grass. I made noises. I shooed. I stomped. I shouted. The eyes stayed right where they were. Blue and Bettina were staring at mumma clearly thinking that mumma has gone ‘round the bend. I thought a few moments and then tried again, this time taking a few steps in the eyes’ direction and dragging Bettina along with me so I could keep my grasp on her. The weeds rustle. Out from the puckerbrush sashays a small cat. A cat. In our backyard, the wolves den. We haven’t had a cat in the yard since the neighborhood mouser tried it once just after the fence went up. Once was all it took. In any case, I figured problem solved. 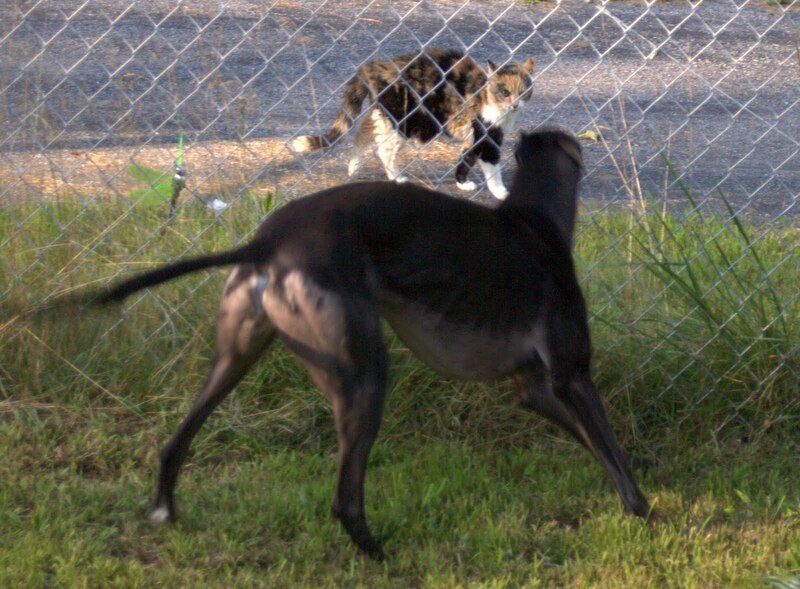 Kitty learns lesson, hounds no worse for wear. Except on Tuesday evening I was sure I was hearing noises every time I walked into the kitchen. Eventually I approached the back door cautiously. We have curtains on the all-glass door. The curtains are sheer which ensures no one can see in during the day and you can’t see outside at night. I thought I was detecting faint movement through the curtain. I flipped on the porch light and jumped back at the unexpected sight of Kitty sitting on the back porch, meowing piteously to come inside. 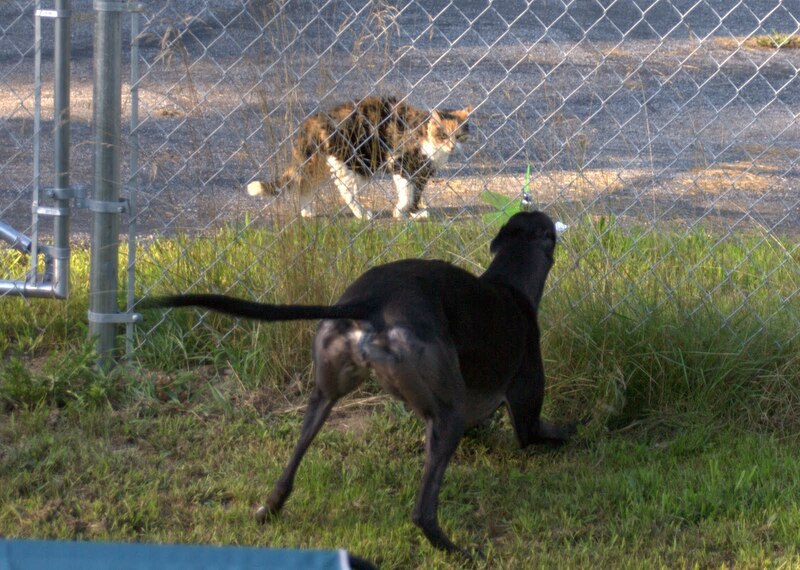 I chased Kitty out of the yard hissing and shouting. I’d hoped to scare it off in order to avoid having to watch Bettina eat it. Kitty disappeared around the corner of the house and was soon back on the porch like some miniature furry peeping-Tom. I had to chase Kitty out of the yard again in order to let the kids out for last potty without significant bloodshed. But Wednesday afternoon Kitty was waiting at the door for us right after work. Bettina, the sight hound, finally saw it and began frantically clawing at the door, poking a hole in my sheer curtains and barking madly. Kitty waited patiently for me as I stepped outside and closed the back door on a major rumble of black fur and teeth trying to force its way out the door right behind me. Kitty was completely un-phased by this show of ferocity and she rubbed against my leg. I picked Kitty up. Kitty snuggled right into my chest. Darn cute little thing! Still, I brought Kitty to the fence and stuffed her under the gate. Then I let the dogs out. Kitty hung out right where she was, just out of reach on the outside of the fence. 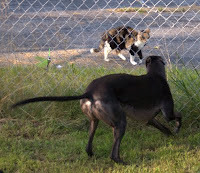 Bettina lost her little mind and ran straight at the fence all barks, growls and fangs. Kitty stood her ground. Completely flummoxed, Bettina amped up the Cujo factor and began again to berate and threaten Kitty. Kitty stood there just long enough to let Her Royal Highness know there was a new royal in town and that Bettina wasn’t fooling anyone with her shtick. Then Kitty leisurely ambled along the fence line, stopping occasionally to watch the whirling dervish keeping pace on the inside of the fence. there was Kitty still mounting her campaign to adopt me. I broke down and fed Kitty some salmon treats on the front porch with Bettina serenading us from inside the house. Kitty began showing up every morning and evening after that. The plan is to take Kitty to the local shelter but she has an uncanny knack for arriving before the shelter is open or after it closes. Bettina has made it exceedingly clear that she would LOVE to adopt the little hors de oeuvre. She hasn’t stopped telling me so, loudly, ever since she finally laid eyes on the furry little bugger. I was successful at finally seeing Kitty during shelter hours and she is now on her way to getting a loving forever home. The shelter has named her Zig Zag and I’m just waiting for her to appear on the website so I can follow her until her adoption. Bettina is disconsolate and hungry. Oh Where, Oh Where Have My Little Dogs Gone? For any who may not be fully acquainted with my life, I must travel for work from time to time. I work for a great company that knows how much my “kids” mean to me. Among the many things they have done for the kids and me, one is that they allow me to bring them on my road trips to New York. Back in the days when Girly Girl was still physically with us and it was Blue, Girly Girl and I, both kids traveled with me. We all spent a week in a great dog friendly hotel. Blue sure does love him some hotel bed. So if I intended to sleep on these trips, there had better be two beds in the room. Otherwise it’s all in on Mumma’s bed and Blue stretches WAY out. Plus he drools and insists on laying his drool-sodden melon on a pillow. I prefer that it not be mine. 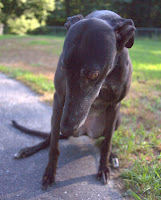 When Bettina joined the family, I had my first experience with a greyhound who barks. For any reason. And many times, for no reason. I say she’s “chatty.” With Miss Mouthy aboard I couldn’t risk taking her to the hotel with us and have her bark all day while I was at the office. I had visions of the hotel manager calling me on my cell phone, raucous barking in the background, with a request that I vacate the premises immediately. Thus, every time I have to travel for work, Bettina gets a week at Camp Grammy. Blue always ends up coming with me on the trip by himself. I figured it would be a great time for Blue and Mumma to do some bonding. Blue might also get a nice break from being bossed around night and day by Miss Mouthy. Bettina has assumed dominion over poor Blue and try as I might, I can’t get him to cowboy up. So a week without Bettina and some quality alone time with Mumma-hound heaven! Except that it turned out Blue was mostly lonely. He got to spend some evenings with Mumma but spent a lot of time in his travel crate with only the TV for company. Blue doesn’t spend much time in a crate at all outside of these business jaunts and here-to-fore he could always look out the window of his travel crate and see Girly Girl across the way, sulking in her crate. After a number of trips without Bettina I began feeling really guilty about schlepping him along with me. He seemed to be getting sadder with each trip. I determined that on the next trip, I would find a way to give him a break. 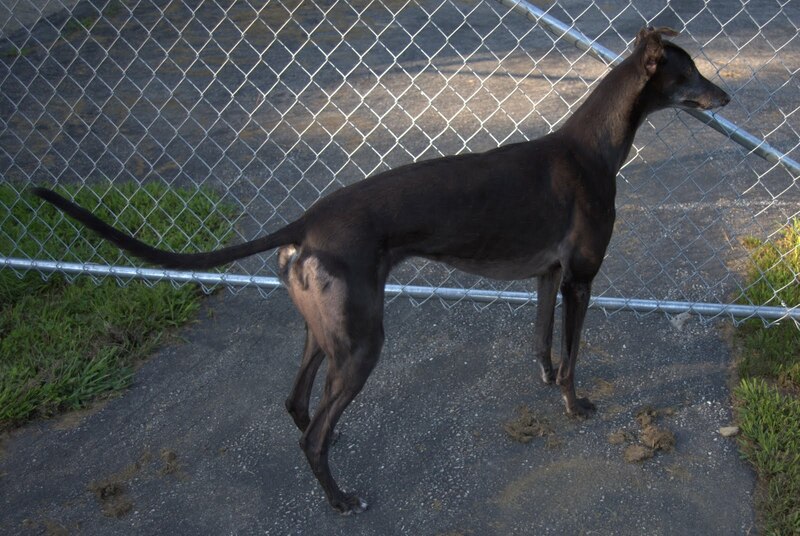 Grammy has taken both my kids in the past, but she lives in a small space with two large male greyhounds of her own. To add two more to that mix can be quite overwhelming. Factor in that Bettina is such a fussypants and Mumma is pushing her luck asking Grammy to take them both. Not wanting to wear out our welcome at Grammy’s place, I reserved Blue a spot at Auntie Carol’s house. Having deposited Bettina with Auntie Carol and Blue with Grammy, I proceeded on my businessy way, secure in the knowledge that my kids would be safe and well cared for. With the added bonus that they’d be in surroundings that made them happy. Both Grammy’s and Auntie Carol’s are similar to home in that someone is around almost every moment of the day. What I didn’t take into consideration, as I began this journey, was Mumma. I get to spend all of my time with my babies. We are together day and night. When I travel I generally get to take them with me. 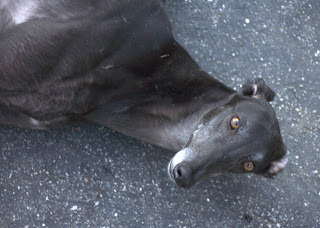 Most of the time I’m traveling to some function that involves greyhounds. If I run an errand, they come along. If I visit friends, they come to. It s a very rare occasion when I am separated from them. This particular trip was interminable for Mumma. Though it was great to see colleagues face to face and get some stuff done that is best done when I am onsite, I missed my babies terribly. I was very lonely in the hotel each night. I even started to miss the drool soaked pillows. Auntie Carol was very kind and sent me daily photo updates on what Her Royal Highness had been up to. Even if she wasn’t, Auntie Carol told me that Bettina was being a good girl. Bettina had taken over the new realm and insinuated herself onto Carol’s couch, on her spare bed and eventually even managed to work her way into Carol’s bed so she could cuddle with Auntie Carol. Each morning there would be photos of her on the couch (where Carol’s hounds are not allowed) or on the spare bed, head on the pillow (Bettina drools as well). Blue, for his part, did likewise at Grammy’s house. 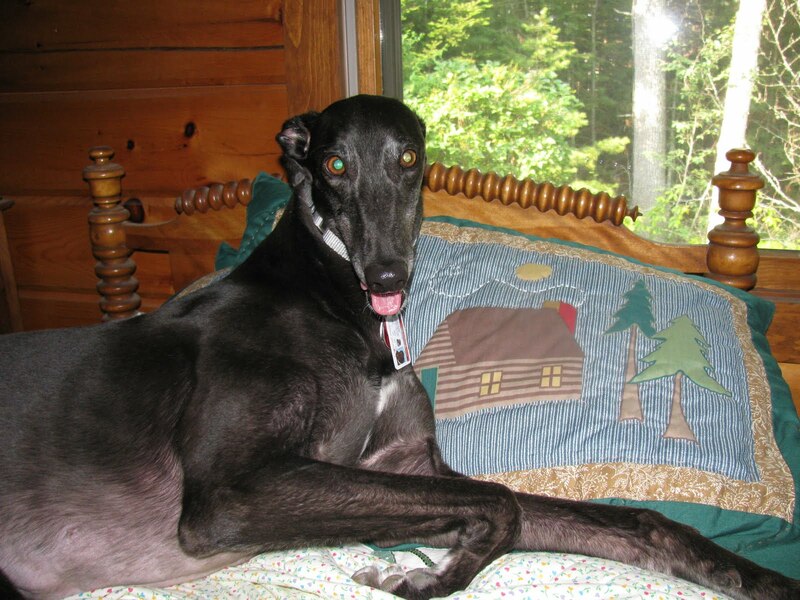 He drooled happily on Grammy’s pillows and stretched out to his full length and width taking ¾ of the bed. He danced for his dinner. He danced for Fox and Crandall’s dinners as well. Everyone seemed to be doing quite well at their respective locations with the exception of poor Mumma. I counted down days until I could drive the 6 hours back to pick them up. I looked eagerly every day for emails from Carol and my mother giving me minute details about the kid’s days. In reality they pretty much did the same thing every day, but it didn’t matter. I wanted to read it all. Finally the day came and I drove back home to pick up my babies. Blue seemed happy to see me but he couldn’t get anywhere near me because Fox and Crandall, Grammy’s hounds, were knocking themselves out to crawl up my legs and say hello. It was such an enthusiastic greeting that you’d have thought they were my missing babies. On the other hand, they may have just been very, very excited to know that Blue was heading back home. Bettina hopped out of Carol’s car and stood facing the other way. We stood there looking at her and she continued to watch down the road as if a parade of dog biscuits would be coming from that direction. Finally I called her name; she looked behind her and gave me an excited welcome home greeting. We got home and Mumma was feeling like all was well with the world. I thought, surely, this is a special moment for the family now that we were all together again. In a little blissful, familial love cloud I floated inside, hounds trailing behind me. I was preparing to cuddle on the couch with both babies while we all sang Kumbaya (well, I’d sing, they’d roo). I turned to see where they were and faced two hounds staring intently at me, drooling. Ah yes, we’re home. What are you waiting for Mumma? We’re hungry. Every greyhound parent likes to think their hound is the most beautiful, charming, special and smart hound that was ever whelped. Most of us wonder what kind of idiots passed up adopting such a gem before you got to the kennel and recognized these amazing qualities. I admit to such hubris on the part of my two babies, Bettina and Blue (and possibly even more so with their predecessor, Girly Girl). They say pride goeth before the fall (or something like that). I can attest to the fact that this is true. 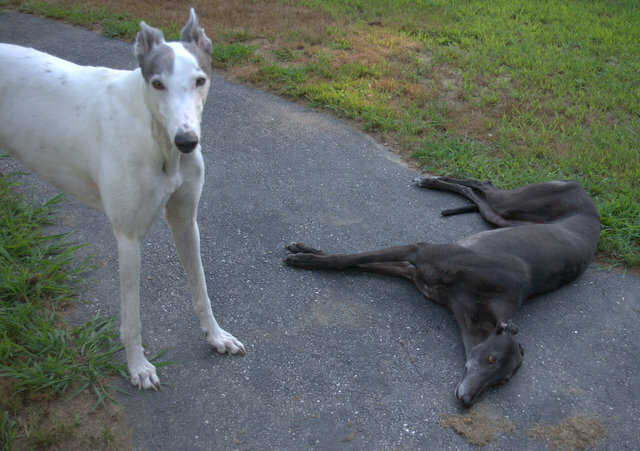 On a recent Friday I took the hounds outside for our typical mid-day break. It was very sunny that day and roughly 85 degrees. Those of you in the South are saying, oh, a nice, if not coolish day. For those of us in the North, this is akin to parking next to the gates of hell and leaving your windows rolled up. It was very hot. This being a Friday, the garbage man had come and I was returning the empty garbage can to its designated space in the garage. Bettina decided that, as my Vice President of Checking Stuff Out, she should be nearby to supervise and observe. She took up a position close to mumma while I went about my task. The side door to the garage has a small paved square in front of it which sits in full sun almost all day. By lunch time, the blazing sun had applied itself assiduously to the square for more than 7 hours. I could feel the material of my Crocs melding with the pavement. So it was with much amazement that I watched Bettina step from the grass onto the asphalt and then carefully and daintily lay herself down on the scorching tar. I managed to sputter out, “Uh Bettina…isn’t that too hot?” And as I bent down to test the temperature with my hand, Bettina suddenly starts shrieking as though…well…as though she were on fire. I can feel that the tar is so hot I had to remove my hand to keep from searing my first layer of skin off. Yet Bettina makes no move to remove herself from the uncomfortable situation as a normal dog might when being cooked alive. Instead she lay there, screaming. As it appeared she had no immediate plans to get up and I was smelling an unpleasant charred meat smell, I stepped over to assist my brain surgeon. After a few tries, I managed to hoist her up to a standing position. I was certain that once she was up, she’d get the heck off the tar. Sadly, I figured incorrectly. She stood there looking at me and whimpering. She’d pick up one paw, cry, and then set it down. She’d pick up the next paw, cry, then set it down and so on. I watched while she did this a few times and I told her to step sideways onto the grass for heaven’s sake. She must have been utterly deafened by her pain as she continued her hot dog dance, oblivious of mumma trying to shoo her onto the grass. My Rhodes Scholar was not making the most of this learning experience, so I had to physically pick her up and carry her over to the grass, a mere 2 feet from where she had been laying and then standing. Blue had watched all this from the security of the nice cool grass. He was looking from Bettina to me and I could see clearly what he was thinking, “and you thought I was the dumb one…” And that was true. I had always thought Blue was the one who “got the looks” in our family. But Bettina’s looking more and more beautiful every day.